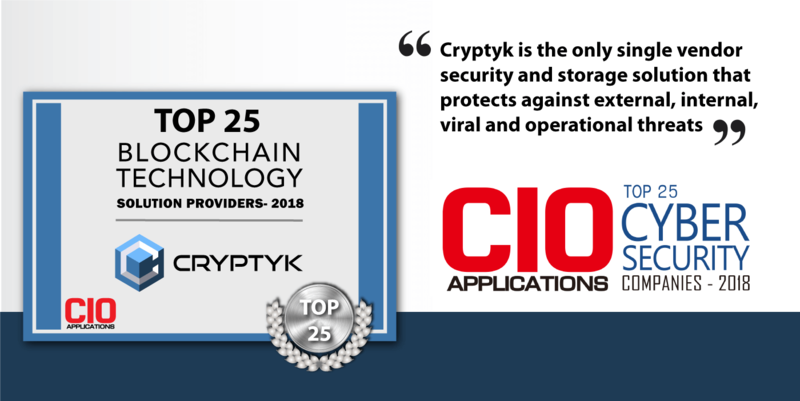 Cryptyk has been named one of the top 25 technology solutions providers in 2018 by CIO Applications, a print magazine published in Silicon Valley that focuses on the applications of technology in medium to large enterprises. As part of the spotlight, they've interviewed Cryptyk CEO and founder Dr. Adam Weigold, who remarks "This year, I believe, the latest crop of ICOS and blockchain technology will be very much enterprise-focused." 2018 has been a critical year for blockchain technology. Periods of uncertainty as governments around the world furthered cryptocurrency regulation were reflected in the markets. However, blockchain projects also stepped into the spotlight for Enterprise applications. Companies such as IBM and SAP announced blockchain projects, and were not the only industry giants to have a visible presence at Consensus in New York. Even Goldman Sachs announced a crypto only investment branch, as well as the launch of a Circle USD Coin by Circle, a payment startup they own. Furthermore, our tokens serve a functional purpose by powering numerous encryption and authorization processes that are permanently recorded on the blockchain...we have structured (Cryptyk) this way so that every time we get a customer, it increases the market demand for our tokens. Hence customer participation and use will drive our token value rather than market sentiment.. [meaning that ] ultimately, the long-term value of our token will be a direct reflection of the success of our product. " To read the full article in a digital version of the magazine, follow this link. Cryptyk is featured on pages 26-27.